Members of ‘Outlookie’, a Korean culture experience team consisting of foreign students in Korea embarked on their 2nights 3days trip to Jeju from October 30 to November 1 to take a firsthand look at the Korean tourism along with members of ‘DadokDadok’, university student reporters’ group of the Korea Press Foundation and ‘ChinChin’, reporters of Chinese Universities’ Newspapers. Focusing on four key words like Hallyu(Korean Wave), Local Culture, Tourism and Smart, the students visiting the ‘Island of Creativity’ tried to find the hidden values of the island through creative tourism activities from a perspective of foreign students to share them with global citizens. 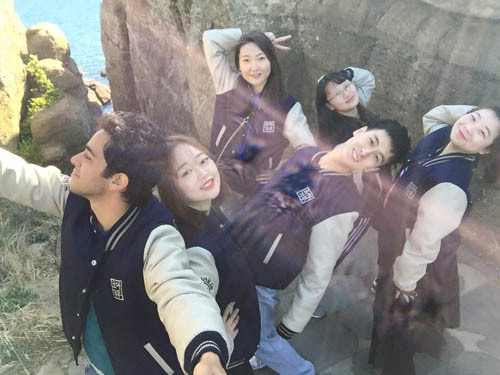 The members were grouped with Korean students and visited several popular tourist spots including Seongsanilchulbong Peak, Yongmeori Coast, Ssangyonggul Cave, oreum, folk village, Teddy Bear Museum and so on. They took photos and bought souvenirs to keep special memories with members of their own group. In addition, they spent a hectic day in recreating famous Korean dramas, movies or music videos of K-pop idols in Jeju dialect. 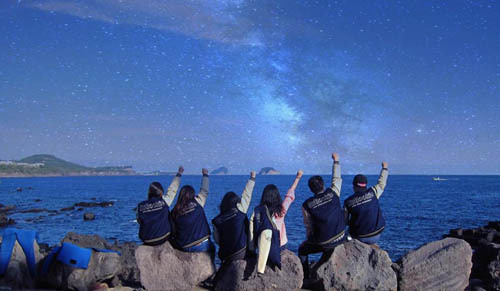 The members who spent busy days in adjusting themselves to Korea and got burned out from competition with Korean students back in schools were given a special opportunity to communicate with local residents in a beautiful natural environment and make unforgettable memories in one of the most famous tourist destinations in Korea. Hally Ong, a member of Outlookie from Mongolia said “Outlookie is like an oasis in a tough life as a foreign student in Korea. The time I spent in Jeju meant a lot to me and I was very happy.” Another from China, named Kim Seol-hwa said “What else I can say? Outlookie is the best!” Attaulla from Afghanistan said “Though the mission part was hard, Outlookie allowed me to make unforgettable memories with other members. So I want to say thank you.” “Delicious tangerine of Jeju Island, Outlookie trip, mission, fun moments together... these things became a symbol of beautiful memory,” Nii Victoria from Uzbekistan said, showing her feeling of regret for this last trip. Meanwhile, ‘Outlookie’ members who have experienced Korean language, Korean food, e-Communication, Taekwondo and Korean Tourism through the five-time Korean culture trips since April are now going to be involved in resolving conflicts and seeking harmony through exchange with Korean students as well as others from overseas countries by participating in ‘Gobal Friendship Festival’ to be held in November. ▲ PrevThe 10th Asian TV Drama Conference Successfully Kicked off in Kita-Kyushu of Japan. 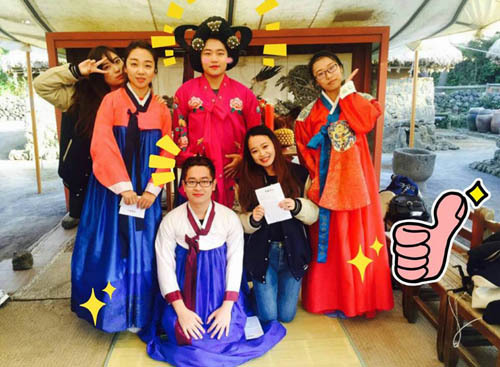 ▼ Next‘2015 Korea Joa’ Overseas Online Opinion Leaders Covered Korean Culture.